Helicopter pilot Rick Lucas has spoken of his survival after his chopper when down in the Pauatahanui Inlet, north of Wellington, describing how he ended up trapped underwater with a stuck seatbelt. Lucas emerged unharmed after the twin-engine BK117 chopper he was flying crashed into the water near Porirua about 11.30am on Tuesday. Heliforce director Dave Borlase confirmed Lucas was flying for the company. It was not yet known what caused the crash, but as far as he was aware Lucas’ flight had started out normally. Lucas said he had been using the helicopter to lift power poles. He closed the throttles and lowered the lever to try to stop the rotation. “But it was still a significant impact and I ended up under the water. I couldn’t get the seatbelt off,” he said. Lucas said he was able to keep his cool. He has been flying for 35 years and said this was the second tail rotor failure in his lifetime – but this incident was his worst. His only injury was a cut to his mouth. The blow to his helmet had also been quite hard, but he considered himself very lucky. Lucas said he had “absolute faith” in helicopters and planned to fly again. He was pleased that two kayakers had paddled out to check on him. Crash witness Reuben Kunst said the helicopter was carrying telephone poles when the cable snapped and hit the tail rotor, spinning the chopper around. 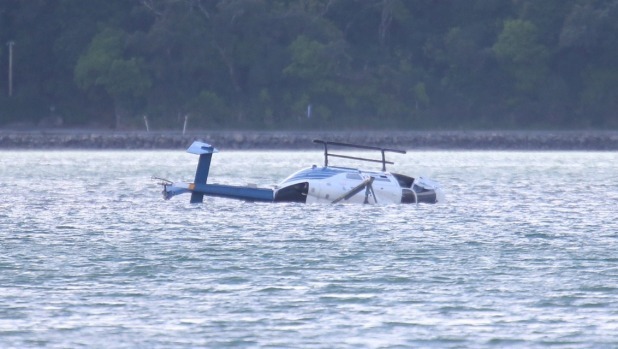 The helicopter took off from Motukaraka Point in Pauatahanui minutes before the crash, another witness said. Georgina Russell, who lives in the Porirua suburb of Whitby on a hill overlooking the inlet, described hearing the helicopter taking off and making an “odd” sound. She raced to her window to see it submerged in the water. She grabbed her binoculars and was amazed to see a man was sitting on top of the chopper. Soon after that, she watched as a canoeist paddled up to him and appeared to be chatting to the man while they awaited emergency services. Precision Helicopters manager Matt Newton said he saw the chopper go down. Newton’s is the parent company that oversees work carried out by other helicopters companies. Heliforce owned the chopper that crashed on Tuesday. Salvage efforts to float the helicopter would probably begin later on tuesday, at high tide, he said. Hayley Presling was driving around the inlet from Whitby when she saw the helicopter flying low across the water, listing at a strange angle. She didn’t see the crash but a friend told her they had heard a chopper was in the water and she realised it must have been the same one. Olivia Marsden, who was working in the Little Black Caravan coffee shop nearby, said she heard the helicopter go down. Emergency services rang the business immediately to get information on the crash, she said. Transport Accident Investigation Commission air investigations manager Peter Williams confirmed an investigation was underway with an investigator at the scene. Lucas was the owner of failed helicopter company, Helipro, which was put into receivership in late 2014 owing an estimated $25-$30 million. The company closed five of its bases, including one at Wellington’s Queens Wharf, in November that year.